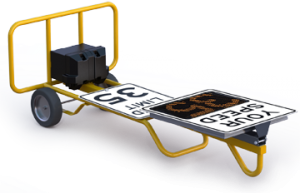 The TraffiCalm Portable Series has added a line of Dolly Mounted Driver Feedback Signs for increasing driver speed awareness and road safety and are designed especially for temporary deployment in low speed areas. The bright 12” characters can be seen from up to 600’ away, and help increase driver speed awareness on the neighborhood streets where so many small accidents occur every year. These portable iQ Series feedback signs include SafetyCalm™ data collection software, allowing you to gather hard data of traffic patterns and program the sign using a laptop bluetooth connection. The 12” Portable radar speed sign offers multi-site versatility. Temporarily deploy the lightweight sign to locations of your choice with the ease of its sturdy two wheeled dolly. 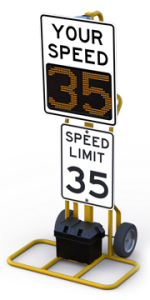 TraffiCalm Speed Feedback Signs are manufactured in the USA in an ISO 9001:2008 certified facility, meeting and exceeding industry standards and state testing requirements. TraffiCalm signs are unmatched in durability, accuracy, ease of use and affordability. SafetyCalm™ Android app available on the Google Play Store. Programmable full matrix display allows the sign to display speed numbers as well as messages like ‘SLOW DOWN’. Includes a 75Ah, Group 24 Battery for several days of sustained operation. K-band (24.15GHz) radar, range 450+ feet. 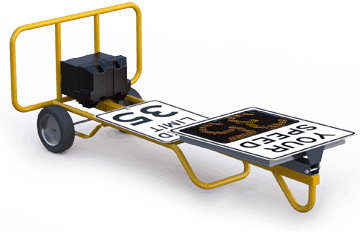 Package Includes: Sturdy Two Wheel Dolly, Speed Feedback Sign, 18″ x 24″ Static Speed Limit Sign w/numerical placards, 75Ah Group 24 Battery, SafetyCalm™ Configuration and Traffic Data Collection Software, installation and user manual. NOTE: Optional AGM Charger sold separately. Traffic Impact Study: Are Radar Speed Signs Effective? A Cause We Proudly Support … See Why.